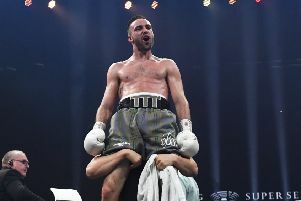 CYCLONE Promotions manager Barry McGuigan believes that in Josh Taylor he has acquired the most talented boxer to emerge from Scotland since former world champion Ken Buchanan. Without wanting to sound disparaging towards any of the country’s former ring greats including Jim Watt or Alex Arthur, McGuigan couldn’t speak highly enough of the 24-year-old Commonwealth Games gold medallist whom he yesterday confirmed will fight at Meadowbank on Friday, 16 October. The Prestonpans light-welterweight boxer will headline the show against Hungarian opponent Adam Mate in his second professional fight since joining the Irishman’s team in April. Taylor stopped Liberian Archie Weah in round two in his pro-debut in El Paso, Texas, last month but will face a much sterner proposition on home soil in seven weeks’ time. “For pure natural ability and skill, I don’t think there has ever been a guy like this since Buchanan,” McGuigan said. “He’s very similar to him in every way. If you look at Buchanan, he had naturally fast hands, southpaw and from Edinburgh… it’s really spooky the similarities. He’s got a serious attitude towards training and we really believe boxing fans north of the border are keen to have someone who they can really hook their hopes on. Buchanan conquered the world’s lightweight division before retiring from the sport in 1982 – nine years before Taylor was even born. However, McGuigan, a former world super featherweight champion, recalled the time he himself had the pleasure of sparring Buchanan prior to a British title fight but has the belief Taylor is every bit as good. “He [Buchanan] came over to help me out at an advanced stage of his career and he just bamboozled me,” McGuigan said. “He was just so talented and Josh is just a carbon copy of him. “Josh has got a tremendous right hook to the body so he’s got serious talent. I think we’ve got the pick of the bunch. “He blew me away in the semi-finals of last year’s Commonwealth Games against [Sam] Maxwell, he was just sensational. “In 18 months he’ll be knocking on a title door, I guarantee it. If we haven’t won a British, Commonwealth or European title in two years’ time I’d be very surprised. It’s about making sure we pick the right opponents but this one coming up in October is a tough test. “But we know what he can do, because we are so confident of how he performs in the gym, that he can move fast towards a title fight and that’s what we expect. We will match him tough because that’s what he needs. There’s no point in seeing him fight easy journeymen. “A lot of people may see all of this as happening a bit too soon and each individual is different. Training and mentoring these guys is like an exercise in psychology, but it’s very competitive in the gym.” McGuigan admits he had no hesitations over his young prodigy making his debut in the US last month, despite the British Boxing Board of Control’s (BBBC) reservations over him doing so. “We had a big argument with the board of control because normally you’re not allowed to make your pro debut overseas,” McGuigan explained. “But going to America, fighting a tough durable guy and he [Weah] came to win, but Josh took that idea out of his head very quickly. “The referee didn’t allow him to finish him completely but you’re going to see explosive fights with this kid. He likes to hunt you down and that’s how he wins. Taylor, as you would expect, is buoyed by his manager’s assertions and believes McGuigan is the right man to steer him towards title fights in the future.